Calendars can do much more than ensuring you are on time for meetings. They can be a central location for project and event materials and knowledge, inform best practices and even assist with corporate administration. 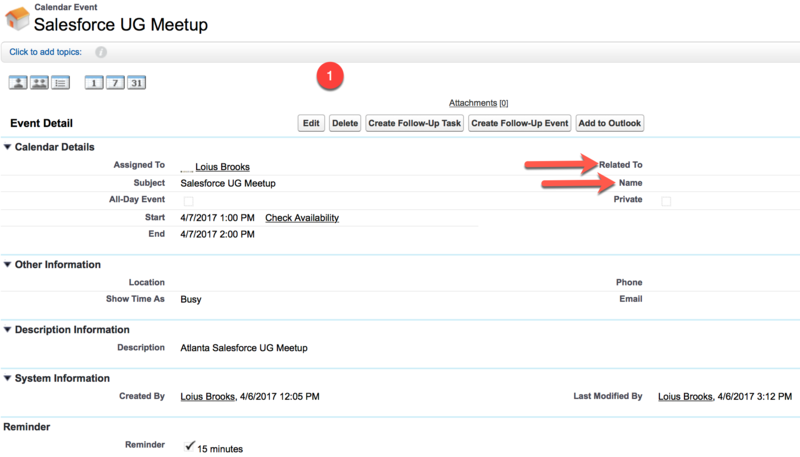 You can grant access to your Calendar in Salesforce, by sharing it with users, groups, all users in a role, or roles and their subordinates. You can choose with whom you want to share your calendar as well as how. Let’s do the groundwork first. Ground Work: – Louis Brooks is working as EMEA Sales Rep at Universal Container. Louis granted, Caroline Bell, an APAC Sales Rep at Universal Container, full access to her Calendar. Click on the Add button to share your Calendar with others. Select user Caroline Bell and then, click on Add arrow to move Caroline’s name from the Available column to the Share With column. Once you are done, click on the Save button. Donna Serdula is working as System administrator at Universal Containers. Louis Brooks has assigned a case to Donna Serdula which states that events (only a few, for more details of the event, refer the following diagram) created by her are not visible to user Caroline Bell. Donna, an Awesome Admin, identified the problem! 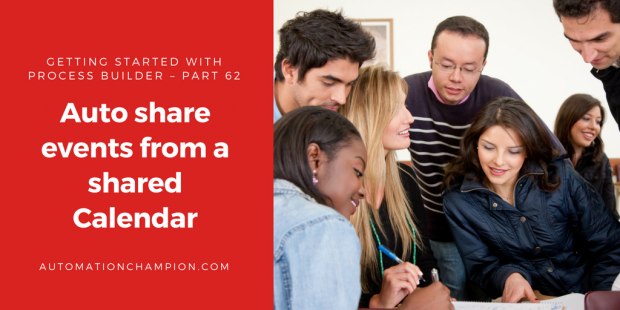 Donna searched the Web and found an interesting article about Why can’t I view or edit an Event from a Shared Calendar? First, concentrate on point 3 (refer the preceding screenshot) and then see image 1. Findings of Donna’s search to resolve the aforementioned problem: Even though Louis Brooks granted Full Access to Caroline Bell to her Calendar, Caroline was able to view the Event on the Calendar but was not able to access Event Detail page because Louis had not populated Related To and/or Name field(s). One real use case from Success Community and credit goes to Rhonda Ross. Check out the success community for more details. Solution #1: – As she has mentioned on the thread, you can solve the need by giving all of those people System Admin access. NOT a good solution. Solution #2: – Another suggestion, She came up with the idea of using Process Builder to find any event that has both of these fields null and updating the name(WhoId) field with a contact record that could be created for this particular purpose. Any trigger that attempts to modify the who_id field on events or tasks OR attempts to add or remove event or task relations that represent related contacts may not save correctly or may not save at all when the trigger is fired during a UI save. The values for whoId or related contacts set in the UI will take precedence over the values set by the trigger. Means, it is not possible to update Name (WhoId) field in such cases via Trigger or Process Builder. To solve the above business requirement, we will update the Related To (to points an account record) field. This solution will work for all, whether Allow Users to Relate Multiple Contacts to Tasks and Events feature is enabled or not. 1. First of all, create an account record with the name Sharing event records. 6. The next task is to add Process Criteria. To do this click on Add Criteria, enter Name, Type of action and set filter conditions as shown in the following screenshot. Once you’re done click on Use this Formula button. Don’t forget to activate the Process by clicking on the Activate button. Note: – I will suggest you guys, implement this first on your developer/sandbox org, test it and then move it to production. Great Post Rakesh. On other note i have a question on invoking process builder to Visual workflow. 1. If my process builder is invoked by Data loader/Integration then 200 records will be updated. From Process builder i am invoking a flow. I want to create a record if an External Id is not populated and update the record if an external id is populated on parent object. In the first pass if there are no records and we try to insert record i am unable to insert the first record and send the rest of 199 records to update path as they are appearing in same transaction. Is there a way to handle this? Use Fast element instead of using the Record element. Review help article “Flow Bulkification in Transactions” by Salesforce.com Inc. Thanks so much for writing this up! got it! Stupid of me… correctly selected the NameID!! When I choose Event as an Object and try to add criteria, in Set Conditions, section, when I do a field lookup I am not able to find WhoId and WhatID for the Event object. Why would that be the case? Hmmm, you have to select Name ID for whoId and Related ID for whatId field in process builder.